Mumbai: The crowning jewel of this anganwadi, near Mumbai’s southern tip of Navy Nagar, is a blue, plastic rocking horse. The worker very carefully brings it down from a shelf high up on the wall. The small room the anganwadi runs in is also her house and has a stove, dishes and rolled-up mattresses, among other belongings. Either the children sit in the room or play on the rocking horse down, the worker who runs the schools says. So the children have never rocked the rocking horse. The anganwadi, or state-run preschool, is run through the central government’s Integrated Child Development Services (ICDS) scheme, one of the world’s largest outreach programmes for children below six years and their mothers. But an ongoing public interest litigation (PIL) filed in the Mumbai high court says the preschool system is running only in name and children between three and six years should be covered under the Right to Education (RTE) Act, which makes education a fundamental right for children between six and 14 years. Child rights activists had been talking about the non-existence of preschool activity at anganwadis for a while, but this time the state government secretary admitted to a lack of space, qualified workers and other flaws. The court has appointed a committee to look for spaces to run anganwadis. As the government mulls overhauling ICDS, child rights activists across the country say that fixing the country’s largest preschool system is increasingly important because unless children get proper preschool education they fall behind at school. The contrast between the government school system and preschool system is widening, they say. While RTE stipulates basic infrastructure for schools, including toilets, playgrounds and a sensible teacher-student ratios, anganwadis have none of that. They get ₹ 750 a month to pay rent. This has meant that less than one-fourth of all anganwadis have their own premises in Maharashtra, and the picture is similar elsewhere. Dipa Sinha, who works with the Right to Food campaign and did a study on Delhi anganwadis, found anganwadis running out of scooter repair sheds and vegetable shops. Many, like the one near Mumbai’s Navy Nagar, run in the anganwadi workers’ homes or in common areas, including temples and mosques. Very few, if any, have toilets or provision for drinking water. In Maharashtra’s tribal and remote Melghat region, infamous for malnutrition deaths of children, the government did build some anganwadi buildings. But Ashish Satav, a local doctor who has filed a PIL against the failure of ICDS to prevent malnutrition, says classes are held outdoors because the buildings are old and dilapidated. But the most common problem with anganwadis is that there is little, if any, teaching. Simantini Dhuru, who is one of the petitioners in the Mumbai PIL and director of a school support programme called Avehi-Abacus, did a sample survey of anganwadis in Mumbai. Of the 25 they visited in Mumbai’s M (east) ward, one of its poorest, only at four was any teaching being done. The rest were either shut or were opened only for food distribution. At some schools, children had slates, but no idea what to do with them and no chalk. In fact, 16 of them did not open until 12.30pm, when school hours are till 1.30pm. According to a survey of anganwadis in Gujarat, conducted by child rights advocacy group, CRY, “a majority of the anganwadis today operate as midday meal service centres. Some of the anganwadi workers even go to individual homes and deliver the midday meal, thus doing away with the entire preschool preparation component of the anganwadis". 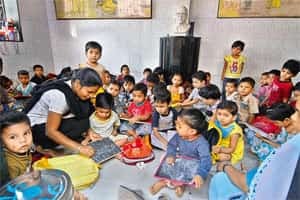 A similar study of anganwadis in Delhi, conducted by a Mobile Creches, which runs crèches at construction sites, found that “preschool activity was hardly in existence". One reason for this is that there is no syllabus that has to be covered for children under six years. States have made various checklists, but there are few studies to show learning outcomes or preparedness for school among these children. According to a study done by Mumbai’s Tata Institute of Social Sciences, 71% of the 200 surveyed government-run anganwadis in Mumbai had a low or low-to-average performance. This was in contrast to the 200 preschool centres run by non-governmental organizations in Mumbai, where 68% were average-to-high or high performing centres. Child right activists say, and the government has admitted in the Mumbai high court, that anganwadi workers are not qualified to teach. In Maharashtra, the qualification for employing an anganwadi worker was recently raised to class X from class VIII pass although, according to national norms, workers should have a one to one-and-a-half-year training after class XII. Vandana Krishna, Maharashtra’s women and child department secretary, told the court that it is hard to raise the qualifications for employing workers because the workers’ union opposes it. Levels of training after employment can also vary. Devika Singh, co-founder of Mobile Creches, says that while training of anganwadi workers varies across states it is often as short as a couple of days of preschool training. Dipa Sinha of the Right to Food campaign says there are some states with no training centres for anganwadi workers. At the anganwadi in the slum near Navy Nagar, the school has a day off and several workers are chatting about the pressure to keep up with paperwork. “It is hard to teach even if we want to because we have to fill around two dozen registers a month about the health and nutrition of mothers and children in our area and so many other things," says one worker who spoke on the condition of anonymity because she is not authorized to speak to the media. Another says that the biggest challenge for her is to fit children into her small house, a prerequisite for any teaching. Even as the central government is thinking about fixing ICDS, Krishna is already working at it thanks to the court diktat, although there is very little wiggle room because the state is implementing a central government programme. “Rs 750 is our biggest constraint," she says. “There are no government-owned buildings and few with clear titles in slums, so what do we use," she says. So, she conducts meetings, scrounging around for free or cheap space in Mumbai and elsewhere in the state. She is looking at dispensaries, municipal schools and halls, among other spaces. She has also suggested that non-profits with experience in primary education teach at anganwadis or train workers voluntarily. Kreanne Rabadi, regional director of CRY, says that this neglect of the preschool programme is also because ICDS primarily focuses on providing nutrition to children and mothers, which has been a challenge in itself. Krishna also says the programme is “over ambitious and the budget too little." For instance, she says that the mandate of providing a midday meal at anganwadis that gives 500 calories and 12 grams of proteins, but costs only ₹ 4, including labour and transport, is nearly impossible. Rabadi says given the failure of ICDS to provide preschooling, children under six years need to be brought under RTE so that they get access to basic infrastructure. Dhuru’s PIL also asks for this and her survey of 125 municipal preschools shows some support for it. For instance, school classrooms are necessarily better and larger than anganwadi premises. They are more likely to have toilets and water. Teachers are not necessarily better qualified and children do not get meals, but they do continue on to school more smoothly than their counterparts at anganwadis. The central government’s Central Advisory Board of Education (CABE) has now set up two sub-committees to look at whether RTE can be extended to children between the ages of three and six and those between 14 and 16 years. “For RTE, we covered six-14 (years) because the Constitution talked of giving eight years of school(ing) to children," says R. Govinda, vice-chancellor of the National University of Education Planning and Administration. “Now that we have more resources we are looking at why we can’t move forward from there." Singh, of Mobile Creches, does say that younger children’s needs have to be comprehensively dealt with, including nutrition and education. “The needs of children under six (years) have to be made a right, under RTE or something else, including education, nutrition, safety etc." She underscores the need for investing in ICDS rather than emasculating it. The central government is said to be looking at several ways of doing this, including hiring an extra anganwadi worker so one can look at nutrition needs and the other can focus only on teaching, as Rajasthan has done. Maharashtra also has two workers, one of whom was supposed to cook meals, but they are now provided by self-help groups. And yet at the slums in M (east) ward, Dhuru found at least three preschools where children were waiting with empty bowls for the worker to come and give them food. Eventually, a family member served the food and school was shut for the day. So, she says, adding a worker would just be a cosmetic change and preschooling needs to become a fundamental right like the rest of a child’s education.